Nowadays finding the exact value of Cryptocurrency is much tricky since the price value is fluctuating up and down this makes business people doesn’t have much clear idea of prices, our script is highly helpful for those which makes interconnecting customer influence. The main objective of this Bitcoin Exchange Rates Script is calculating values of the 1000 plus cryptocurrency information at one place such as BTC, ETC, XRP etc.totally around 156 government currencies such as Euro, Dolor etc. Market Value Script page is highly customizable option to amend the script like table modification, currency chart, converter module in such a way that user will manage all pages and sub pages with simple basic concepts through admin panel. Being responsive we are not restrict the design;Bitcoin Price Listing Script is coincide with all medium platform, and simple admin panel to manage all user and currency rates. In the admin panel one will collect information about all history of currencies in a chart manner, manipulate the data with elegantmethod. Social integration is the additional value to the script that user might share Exchange values to the social media, swell your value to market that makes reaching value to competitive industry. Our Cryptocurrency Price Listing Script is developed based on PHP and MySQL which makes high sanctuaries of the code and upon purchase you will able modify the script based on your requirements and modify the currency chart. 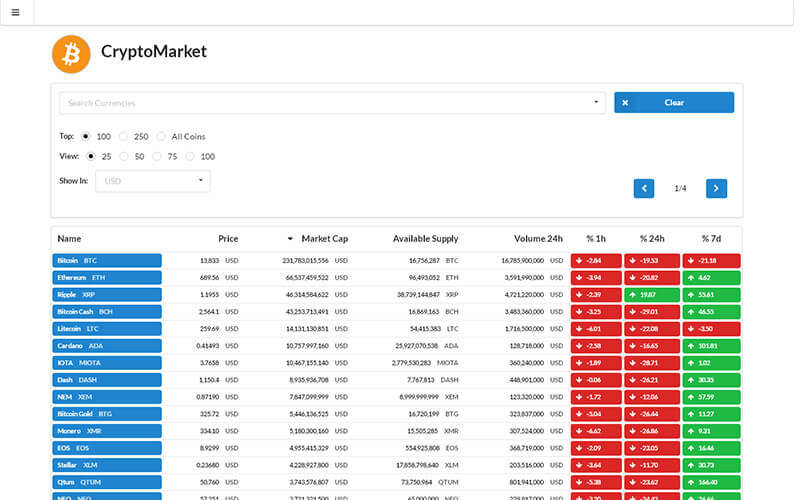 You can highlight your featured coins at one place to attract attention of the users and make blog news about current market values, hidden values of the cryptocurrency as well so that user will get more information about the concepts behind CryptoMarket. I had some issues with other cryptocurrency script, at last I tried phpscriptsmall’s product that gave me an excellent result. Am happy with their work level. Recently, I started using this script and I’ve tried all features which completely worked well. Particularly, am impressed with their concept. My friend suggested getting this script to buy from this team. Initially, I was confused then later their work concept pleased me. Nice job!